Hooking up single color common anode LED Lights is a pretty straight forward process. Incorrect wiring can result in the product simply not working and can result in a damaged product. Follow these simple wiring steps in order to be sure of correct installation. All of our LED Product here at Ecolocity LED run off of DC, or direct current, power. DC is used to refer to power that only travels in one direction. 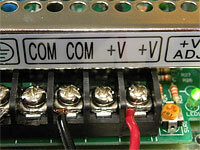 The positive and negative terminals of a DC power source are always, respectively, positive and negative. Current always flows in the same direction between those two terminals. 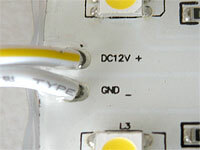 Therefore a single color light uses one polarity, or positive(+) and is then shared with a common or ground (-). When hooking up your single color LED lights all you need to do is distinguish the positive(+) from the (-) and then hook up your lights to the correct DC Voltage power supply accordingly. See the common wire colors below for reference. Once you have distinguished your positive wire from your negative wire, all you need to do is hook up the wires accordingly to the low voltage output of your power supply. Always be sure to turn off your AC power when installing the high voltage input to your transformer. If you are using a power supply with a barrel connector we carry plenty of barrel connector products to assist in a quick and easy connection. If you are using a bare wire style power supply, splice the wires from your power supply to the wires from your LED lights. If you are using a power supply with screw down terminals simply place the wires into the correct terminals and screw down until a secure connection is made.